Can Bing be as Big as Google ? Google which leads the search engine wars with a comfortable margin having a major chunk of all searches with about 60 % of total search using google make google a big brother of the business and yahoo and microsoft doing its best to catch up with google by providing something new. 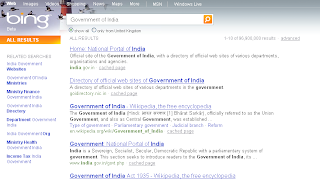 So it make some notable changes from its erstwhile search engines Live search. Notable changes include the addition of search suggestions as you type and related searches (called "Explorer pane" on the left side of search results), based on semantic technology from PowerSet which Microsoft purchased in 2008 Bing also includes the ability to Save & Share search histories via Windows Live SkyDrive, Facebook, and e-mail. And don't forget that recently Wolfram Alpha also come out with its search engine which computes result and is a step towards AI(Artificial Intelligence). Stats come up instantly when you ask distance between two cities, population of any country and so on. So I can only say 'BING AND DECIDE' whether Bing be as Big as Google ?